The Lottery has been drawn for this week. Mrharold is the winner of the 434,800MP Jackpot with the winning numbers of 4, 1, 6, 14, 15 and 20! Congratulations! Last Week's Raffle has now ended. liaistoatalyawsom is the winner of the Red DNA and 100,000MP prize with the winning raffle ticket number 9455! Congratulations! Make sure you buy your tickets for today's raffle - only 10MP per ticket! There are 50 random new Items restocking in many of the Maradan shops. We have just released a new Goals Game. At every level you have a new goal to complete related to Lush Lake. Each level gets harder to complete but you will receive a prize for completing each level. Unlike quest and mission games, you have unlimited amount of time to complete each goal level and you can only complete them once. New levels will always be added to the Goals in each world. Prizes include rare items only avaliable from goals, MP, BP, RP, Dukka Coins, Account Upgrade Credit and stats for your pets. The Lush Lake Goals is the ninth world to have goals and currently has 10 levels for you to complete. New levels will be added in the news to these goals all of the time, each with a brand new prize. The Lottery has been drawn for this week. jetbelldelight is the winner of the 440,500MP Jackpot with the winning numbers of 6, 5, 7, 4, 3 and 2! Congratulations! Last Week's Raffle has now ended. kristyvo10 is the winner of the Red DNA and 100,000MP prize with the winning raffle ticket number 4565! Congratulations! Make sure you buy your tickets for today's raffle - only 10MP per ticket! The new March Account Upgrades have been released! There are 2 different themes - Vampire and Leprechaun! The Vampire themed Account Upgrade has the following items. 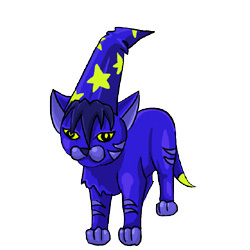 There is also a 1 in 3 chance that you will get a limited edition Tasi pet potion instead of Reese! The Leprechaun themed Account Upgrade has the following items. There is also a 1 in 3 chance that you will get a limited edition Tasi pet potion instead of Ideus! The mutant, prison, zombie and mummy Tasi pet colours have just been released. The new March Account Upgrades will be released later today, so you have just a few hours left before we RETIRE all of the Limited Edition AU Items and all of the older March, April, July, August, September and October Account Upgrades! The new March AU has 2 themes - Leprechaun and Vampire!! The 52nd species of Marapet has just been released!!! The Tasi is limited edition and will be avaliable really, really soon!! The Lottery has been drawn for this week. chihuahua9 is the winner of the 732,800MP Jackpot with the winning numbers of 18, 17, 16, 15, 14 and 13! Congratulations! Last Week's Raffle has now ended. olitar1234 is the winner of the Red DNA and 100,000MP prize with the winning raffle ticket number 10998! Congratulations! Make sure you buy your tickets for today's raffle - only 10MP per ticket! The CD Shop has had a huge amount of new music delivered! These 30 CDs are now restocking. You can visit her once every 3 hours to Test Your Strength. The game is FREE to play. 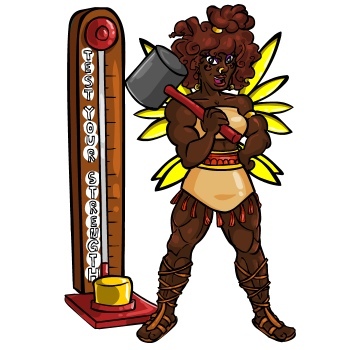 The Gigantic Fairy admires others who are strong like her, and encourages you to go the Gym to get strong. Take the mallet and hit as hard as you can! The stronger you are, the more you will be rewarded! Can you find this Gigantic Fairy hidden avatar??? The Meat Shop is now restocking 30 new items. 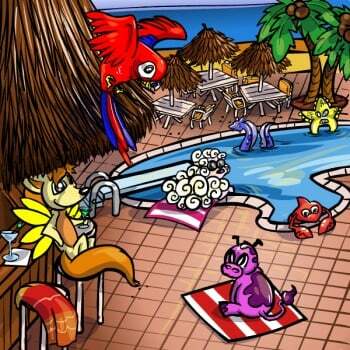 An Island Resort has opened in Minipet Island. Going away on vacation? Need someone to look after your Minipets because you will be away and do not want them to run away? You are at the right place! A stay at this island resort costs 50MP for the first night and then 5MP for the following nights. The CD Shop in Ziranek just got a new batch of items. These 15 new CDs are now restocking. There are 28 new Photos for your collection! The Chocolate Shop has 9 new items on sale. The Meat Shop is now restocking 20 new items. 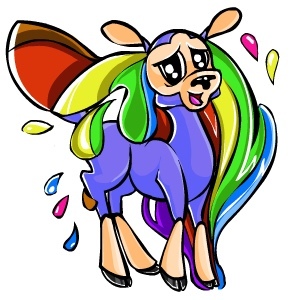 There are 12 brand new Minipets on sale at the shop on Minipet Island. Our newest Dress Up Game has just been released. This doll maker is Lady Gaga. We have arranged some of the clothes, shoes and hair styles avaliable for Marapets dolls to look like what we think would be Lady Gaga. You can play with the doll maker to dress up Lady Gaga. If you like some of the clothes or hairstyles, you can get them on the site for your own dress up character! The hairstyles are now avaliable at the Salon, and some of the clothes are avaliable for free at the Clothing Rack. The Editorial has been reset and all questions asked for the next issue have been deleted. They were all too old and most have already been answered by now. You can now all submit your questions for the next issue that should be soon. There are 25 new Black Pet Photos avaliable for your Photo Albums collections. You can now once again refer new players to Marapets. However, it is no longer automatic. To avoid any possible cheating or referral selling/scamming, we manually monitor every referral from your referral URL and only approve the genuine referrals. Please note that at peak times, it could take upto 14 days for a player you have referred to show on your referral list and for you to receive the credit for it. If you refer enough players with your referral link, you will be able to win awesome prizes such as Rofling Potions and a Mugen minipet! Visit the referral system at the Dukka Caves for more information. You now receive also an alert when you have referred a new player. The Meat Shop has 7 new tasty items for sale. 12 new Angel Photos are now avaliable for your Photo Albums. If you have a Speiro or a Zetalian, it can now wear the Dark Costume. The Potions Shop has 47 new potions restocking. This is the first shop in Marapets that now restocks items upto Rarity 40! Obviously, it will only restock items of rarity 31-40 very very very rarely. And only potions that are supposed to restock, that are not avaliable elsewhere on the site, will restock in this shop. 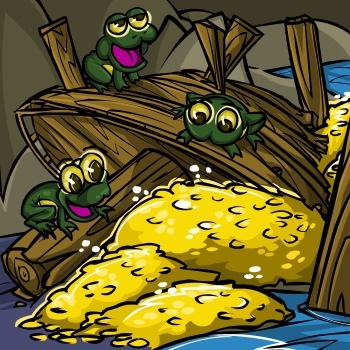 The Minipet Island Goals now have 17 new levels! The way that Shops in Marapets restock has changed. We have edited every shop to improve the economy of the site. Items over Rarity 20 have been fixed and restock again. We have improved the quantity of items restocking, so that it better adjusts to the number of players online. Restocks are no longer random, they happen every 5 Minutes. Every shop has its own, different restock time, so essentially there is a shop restocking every minute past the hour. There are also 13 new items restocking in the Bakery and Halloween Treats shops. Can you find these 4 new Hidden Avatars?? The Lottery has been drawn for this week. dudewheresmycarz is the winner of the 930,100MP Jackpot with the winning numbers of 9, 12, 14, 4, 1 and 7! Congratulations! Last Week's Raffle has now ended. Strome is the winner of the Red DNA and 100,000MP prize with the winning raffle ticket number 27815! Congratulations! Make sure you buy your tickets for today's raffle - only 10MP per ticket! The Trash Fairy is the failure of all of the Maradan fairies. She used to have a high paying city job and a beautiful house near Lush Lake. 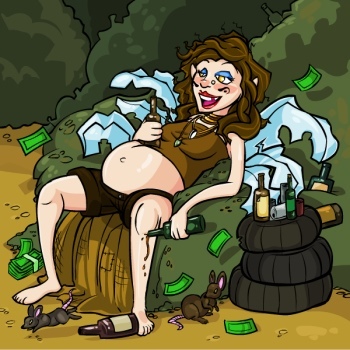 Her drinking made her lose her job. Her gambling made her lose her house. She moved to Hicksville with the job of protecting it, but was passed out at the dog track when the Vortex hit. She doesn't do alot anymore, but she still loves to gamble - just not for MP anymore. You can visit her once every hour and guess which of the three cups she has hidden the bottle cap under. The game is FREE to play. If you guess correctly and find the bottle cap, you will get a prize and move to the next level. The game ends when you guess the wrong cup. Each level has a prize to be won. Can you find this Trash Fairy hidden avatar??? The missing Mummy Troit has now been released. The zombie, mummy, prison and mutant Arinya have also been released! We have fixed all of the known problems with our Dress Up Characters. All Character Costumes are now treated as clothing, and not hair, so they can be put on properly and changed colour by the Lush Fountain again. Wigs can change colour and they fit male and female characters properly. Broken clothing and hair has also been fixed. There are 6 new Hidden Avatars for you to find!! !